From a Model to a Full Sized Angyaaq, Reversing Forgotten Knowledge Within Indigenous Communities. There are only 13 traditional model Angyaat (open boats) that have been found in museum collections around the world from the Sugpiat region of Alaska. No full sized ones exist from the past. The Angyaaq was nearly lost to time and it is museum collections that have kept this knowledge alive and allowed the Sugpiat to relearn and put this knowledge back into a living context. In 2014 we made models and then in 2015-16 we constructed two full-sized functional Angyaak. This project shows the value of museum collections to tribes and vice versa. 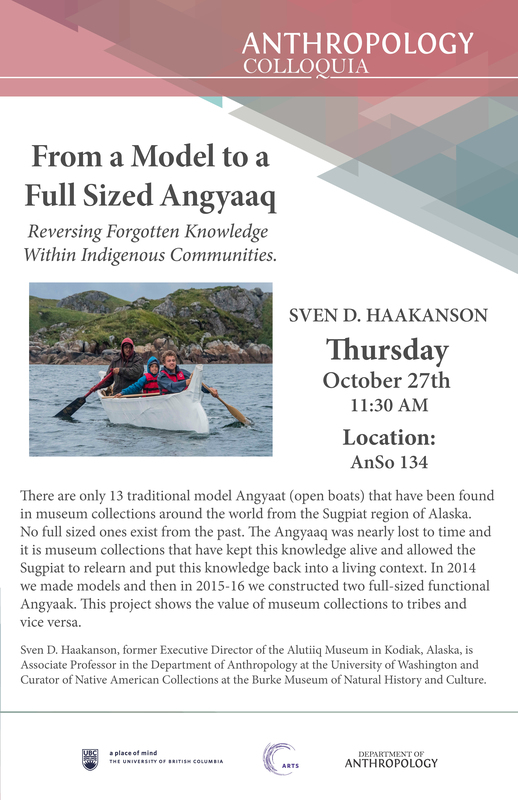 Sven D. Haakanson, former Executive Director of the Alutiiq Museum in Kodiak, Alaska, is Associate Professor in the Department of Anthropology at the University of Washington and Curator of Native American Collections at the Burke Museum of Natural History and Culture.